We left Israel and have moved into the country of Jordan. 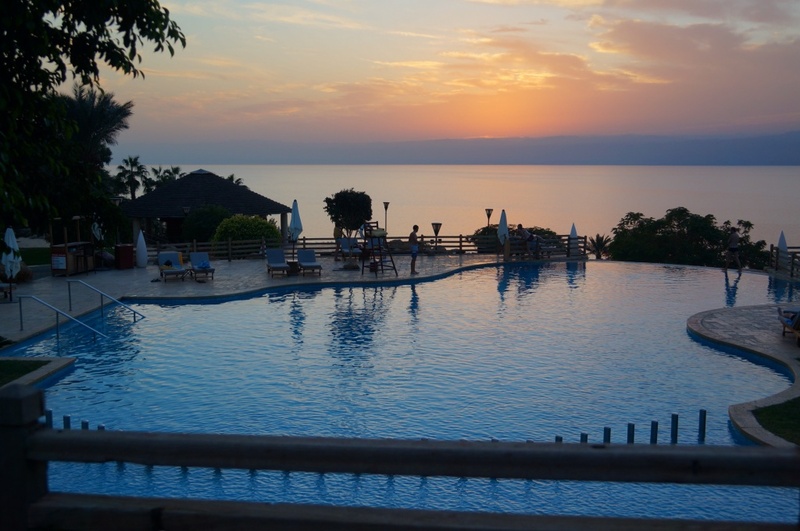 It’s a bit nerve wracking since our Israelis tour guide cannot travel into Jordan. We were handed off at the border, transferring from one guide, to a Jordanian one who will guide us through the next country. “Welcome to the safest country in the Middle East,” he says as his opening line to us. It makes us all a little nervous because for the first time in our touring ever, we have a guide, a bus driver, and an armed guard traveling with us on the bus for the duration of our tour. I think it’s better not to ask too many questions about why we need him, but it’s for our safety and assistance…sounds good to me. In spite of Jordan’s population being 92% Muslim, and 6% Christian, Jordanians have a strong sense of pride to own a big piece of the Holy Land with it’s important history. Moses died, Jesus was baptized, John the Baptist settled here, the Prophet Elijah went to heaven in a chariot of fire, and the Ark of the Covenant was hidden, all here in a Jordan. 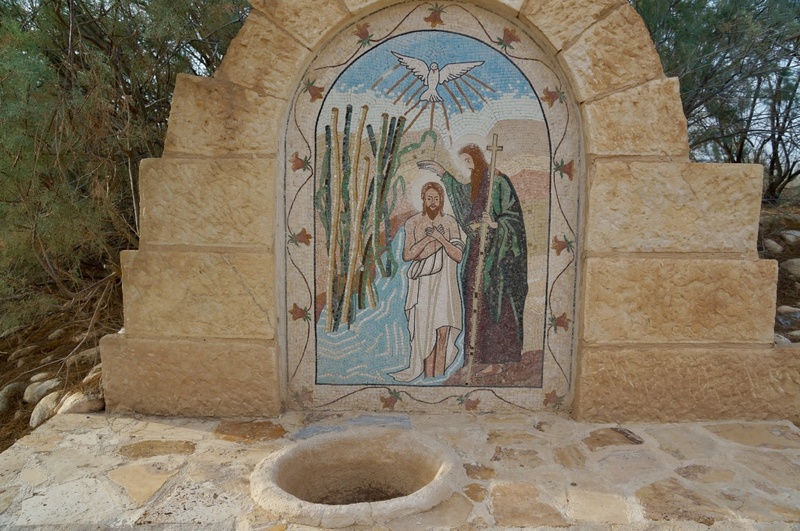 There are many sites along the Jordan River where they have established places to be baptized as Jesus was 2,000 years ago, but Jordan has THE actual site where John the Baptist actually baptized Jesus. 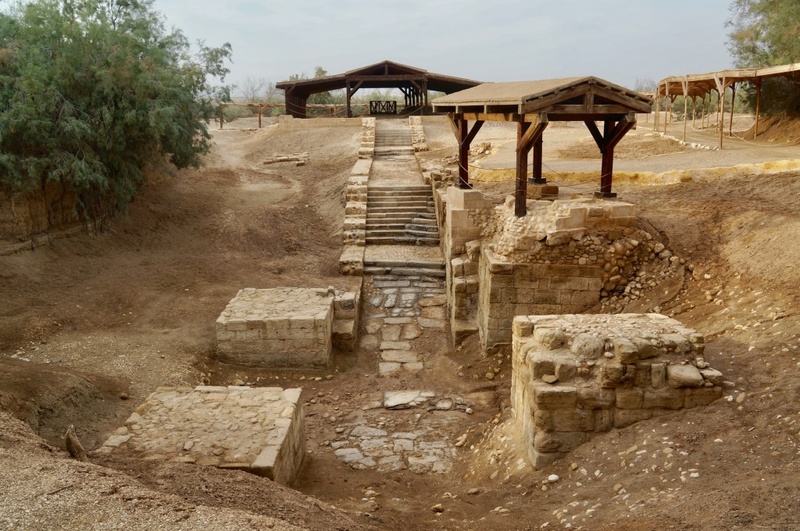 It’s been over 2,000 years, and during that time, the Jordan River has changed. Because of flash flooding, earthquakes, and weather conditions, the river has slowly changed directions. Where the water once flowed, is now dried riverbeds. As recent as 1997, all that you see above was covered by the earth. It has been a process of excavation and discovery to determine that this was THE Location of the baptism. Our tour guide’s former professor was one of the people involved in the finding of the site. After the death of Jesus, the Christians were in hiding. The Romans determined that it was illegal to be a Christian. Those who professed their faith were persecuted and fed to the lions as Gladiator entertainment for the Romans. For 300 years, Christians met in secret. That all changed in 313 AD, when Emperor Constantine the Great stopped persecuting the Christians, which was the turning point for Christianity. That’s when the first churches were built. Over the next 600 years, four churches were built on this site. In spite of the floods and earthquakes, and destruction of the churches from various acts of nature, the churches kept building right here. After destruction, why would you build here again? Why not go somewhere else to build? It was because this was THE Holy site. They had to have their churches right here. 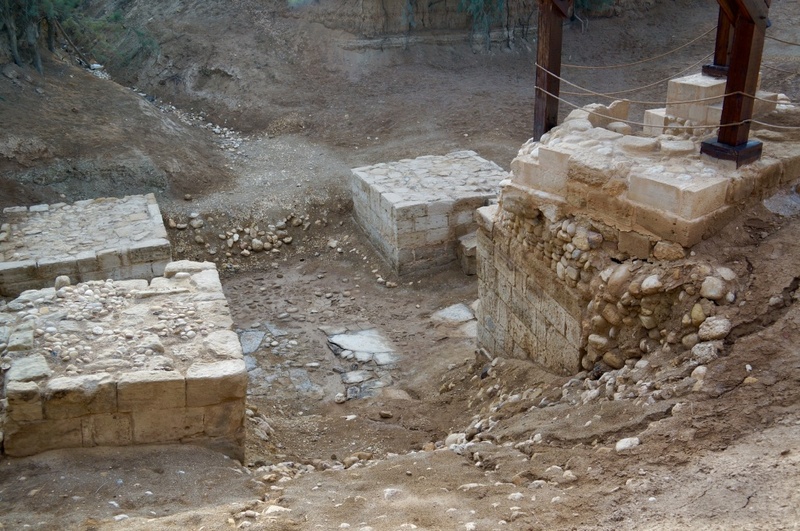 If you draw a cross between these four corner blocks from the church, there in the center would mark THE place where Jesus was baptized by John the Baptist. 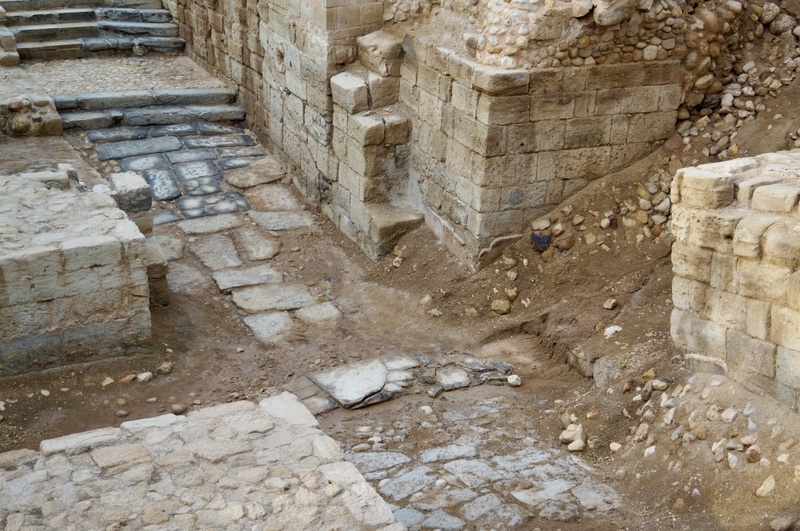 From their archeological digs, mosaic floors from all four churches have been found. Each church has a mosaic of an image of the baptism, in four separate churches, different denominations, over a span of 600 years. In the Bible, it mentions a particular tree at the Baptism. The only known place where this tree grows on earth is here, in this location. 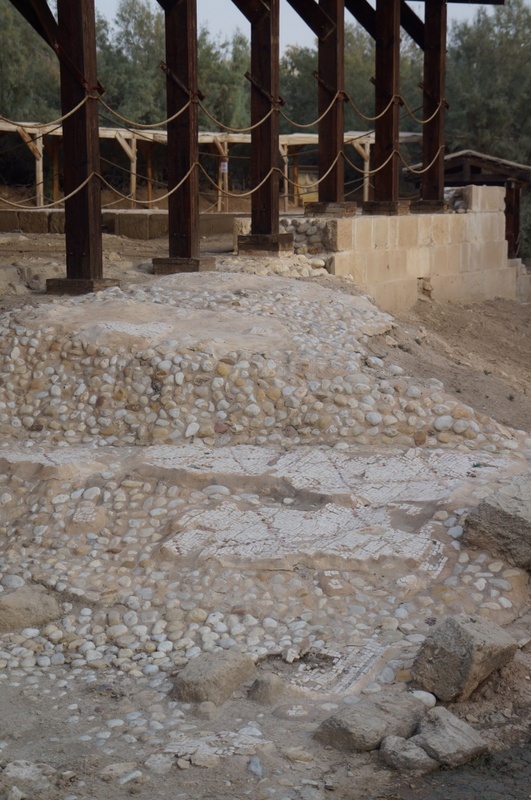 Through the archeological digs, carbon dating, historians with knowledge of the unique nature of church designs on the Jordan River, what is said in Bible descriptions and ancient texts, and several other research sources, they have positively determined that this is the exact place. It has been certified by the UNESCO World Heritage organization and the Pope. 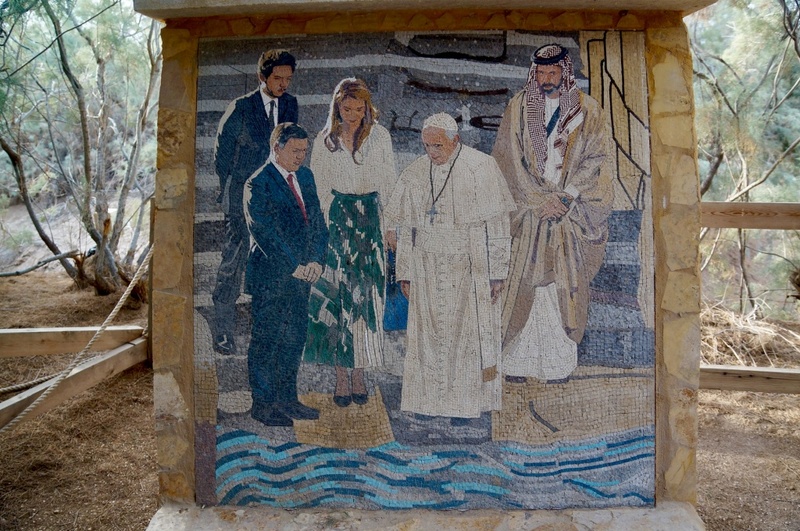 This mosaic shows the official approval with the Pope, the King and Queen of Jordan. One never knows where this baptismal site is going to reside. The line of yellow rope floats separate the Jordan River into two sides. These people are all on the Israel side. The other side of the river belongs to Jordan. 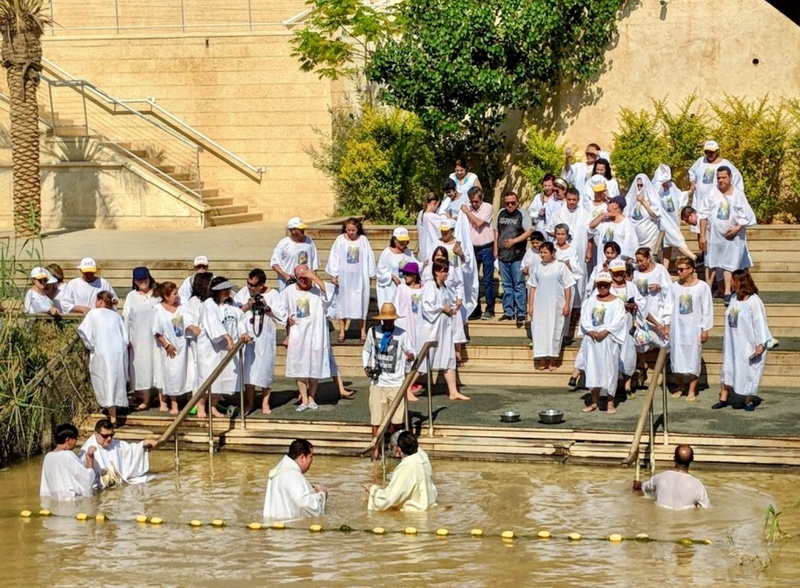 Who know what will happen to the Jordan River over the next few hundred years, and which county will again hold this holy site? I’ll be the first to tell you that I am not the expert on the archeology and history of how they made this determination but I’ve done my best at trying to explain a difficult topic. It’s pretty amazing that this incredible discovery has been made in our lifetime. 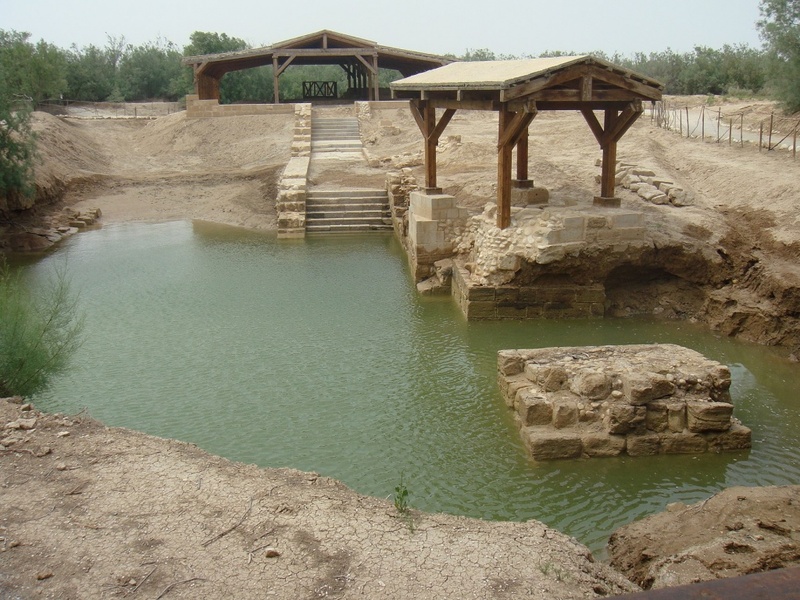 For those of you people who would really like to know how they determined that this is the actual, real location of the baptism of Jesus, here is the full report from the UNESCO World Heritage Site organization. Amazing & beautiful !! What an incredible journey !! What an incredible journey. I told Ashley that you prayed for Charleston. She and I thank you from the bottom of our hearts. Fascinating Humans are crazy. Stay safe.